Paul McCartney and Ringo Starr sang "With a Little Help From My Friends" into the same microphone as part of their most significant collaboration in decades Saturday night at New York City's Radio City Music Hall. The former Beatles, who also performed by themselves, played three songs together - with "Cosmically Conscious" and the finale "I Saw Her Standing There," backed by an all-star band that included Sheryl Crow, Eddie Vedder, Donovan, and Beach Boy Mike Love - to cap the "Change Begins Within" benefit organized to raise funds to teach Transcendental Meditation to 1 million children around the world. 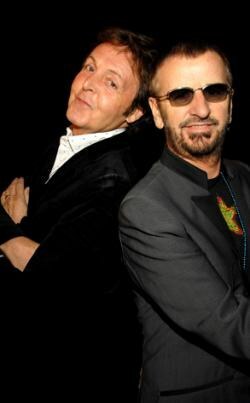 Though McCartney and Starr have appeared together only a handful of times since The Beatles disbanded in 1970 and performed together even less - most recently in 2002 at "A Concert for George," a tribute to the late Beatles guitarist George Harrison - they seemed at home together, even vamping to see who would get the most applause. Starr has said a full Beatles' reunion would be too painful after the murder of John Lennon and Harrison's death from cancer. However, he and McCartney did join forces Saturday night to support the director David Lynch, whose David Lynch Foundation is trying to further the cause of bringing meditation to children. McCartney credits Transcendental Meditation, learned from its founder Maharishi Mahesh Yogi, as "something to stabilize us at the end of the crazy '60s." The McCartney-Starr collaboration was the biggest of the night's big-name pairings. Pearl Jam's Vedder and Ben Harper teamed up for a fiery, passionate version of Queen and David Bowie's classic "Under Pressure." Crow and Harper delivered a gorgeous version of Harrison's "My Sweet Lord." It may have been comedian Jerry Seinfeld, though, working solo, who drew the biggest non-Beatles ovation. "Don't meditate on me," said Seinfeld, adding he has meditated for 37 years. "I've got some jokes to tell here." Howard Stern was serious in his appearance, explaining how meditation saved his mother's life, though he also enjoyed the moment. "I grew up in Roosevelt, Long Island," Stern said. "If you would've told me that one day I'd be on the same stage as them, I wouldn't have believed you."